When your opponent Normal or Special Summons a monster(s) (except during the Damage Step): You can Special Summon this card from your hand to the opponent’s field in Defense Position. This card’s controller cannot Fusion, Synchro, Xyz, or Link Summon unless they use this card as material. Another member gets added to the “C” family. Contact “C” is not as good as the other members of its archetype. While stopping Extra Deck summons (minus Pendulum) can be good, if they can still use this monster to do an Extra Deck summon, then you’ve lost a card and helped them, might as well be a -2. Stopping a Fusion Summon with this should be easy enough, Synchro you may end up out of luck with Contact “C” being Level 6. Xyz Summons are most likely getting locked down by this card. The problem is those pesky Link Summons. With little restrictions on Link Summoning in regards to materials typically, this is a free monster for them to use. There is potential for this to be useful, as it can stop your opponent from going for an Xyz (most likely) and force a Link Summon. Stopping Utopia the Lightning can be a game-saving move, but you still provide your opponent with a material for Link Summoning. From everyone’s favorite card series comes a new addition, Contact ”C”. Contact ”C” is a Level 6 EARTH Insect with 1500 ATK and 2200 DEF. Stats are very odd on a Level 6. EARTH is a good attribute, but Insects are very undersupported. I guess most of this won’t matter that much considering this is summoned to your opponent’s side. 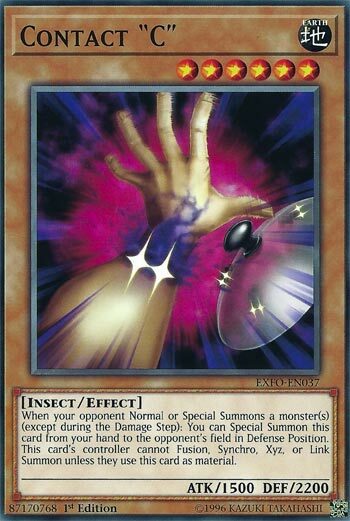 When your opponent Normal or Special Summons a monster, you can summon this from your hand to their field. Gives me Flying ”C” vibes, and this can stop more than XYZs. While a player controls this card, if they want to Fusion, Synchro, XYZ, or Link Summon, they have to use this card. I can’t think of many Fusions that will require a Level 6 EARTH Insect, so this can really kill Fusion decks. For Synchro Summons, this really only goes well with a Level 1 or 2 Tuner, so maybe if their Tuners are higher levels or their Synchros have low levels, this shuts Synchros down. For XYZs, Rank 6 spam isn’t common, so that won’t be an issue. The problem comes with Link Summoning. There are several generic Links out there, so if the opponent is planning on going for one, you are just giving them another material. This can prevent non-generic Links though like Electrumite. This thing can really be an obstacle for your opponent, because their next Extra Deck summon will have to use this card in some way. Very interesting choice for a side deck. Art: 2.5/5 I’ve seen better ”C” artwork. Fusion: It probably will shut down most Fusion, as I can’t see this being used for any real Fusion you’d see played. XYZ: A generic Rank 6 is a possibility, but at the same time, people don’t play many Rank 6 Monsters or higher Level Monsters in most Decks overall, so this could be effective here as well. Synchro: Again, this is dependent on the Deck. Some Decks have Tuners (regardless of whether they even Synchro Summon or not) and you’re likely going to hope the opponent doesn’t have (m)any Level 1/2 Tuners, cause a Level 7 or 8 Synchro is the most logical option here. Link: I feel this card is probably most ineffective against Link. Like XYZ to a degree, if your opponent is going simply for a Link Summon, they have a new card to use (obviously they must) but for something more Deck or theme specific, this might slow it down. It’s a nifty Hand Trap of sorts, and could be beneficial. I wouldn’t fault an experienced player trying this out, because it certainly could be useful. Art: 3/5 The picture is cool, not great though. Most of the “C” cards have cool art though.